Bring on the barf bags, because here we go again. (rolls eyes) The only reason I'm posting this trailer is because I loved the book so so much. Eclipse was definitely my favorite in the saga. I just hate, HATE how they ruin the movies. They make me want to vomit! With that being said, I'll most likely see it anyway, just because I'm a huge fan of the love story/books. 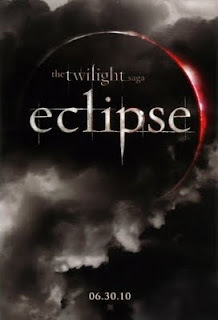 This teaser/trailer for "Eclipse," is the third movie in the Twilight Saga, based on the books by Stephenie Meyer. This time Bella must choose between Edward the vampire and Jacob the werewolf. Reprising their roles are Kristen Stewart as Bella Swan, Robert Pattinson as Edward Cullen, and Taylor Lautner as Jacob Black. Also starring Anna Kendrick, Ashley Grene, and Peter Facinelli. In theaters June 30, 2010. I suppose it'll be a good "home movie" watch. I've forgotten some of the book, so it'll be good to see it "at home" at the movies. What did you think? Can't wait to see it. Shall we all go together?? ?